Fifteen years have passed by since the ‘sanest Sinhalese voice’ was stilled by the Elite Time-Keeper. In those pre-internet, pre-email days, for news from Sri Lanka, I solely depended on Mervyn de Silva’s Lanka Guardian magazine (for public and essential items) and monthly-semi annual-annual letters from parents, kin and friends (for personal and kept-press censored items). Thus, when the death of Edmund Samarakkody reached me in Osaka via Lanka Guardian, almost three weeks had lapsed. This is what Mervyn de Silva had briefly noted. Immediately I penned a mini-eulogy to Edmund Samarakkody and posted it to Mervyn de Silva, which he had published in his magazine. Until then I hadn't felt like contributing an eulogy to a Sinhalese political leader. But, in my understanding, Edmund was different from all others. This is what I wrote. The news of veteran Samasamajist leader Edmund Samarakkody’s death saddened me (LG, Jan.15). In my opinion, he was one of the handful of Sinhalese political leaders who commanded respect among the Tamils for the stand he took on the ethnic conflict. He never compromised his principles for office. Though you have mentioned his victories in the 1952, 1956 and July 1960 general elections which enabled him to serve as a member of parliament, what I consider of more significance are the two losses he suffered in the 1947 and 1965 general elections. In 1947, he contested against the ‘father of the nation’ D.S. Senanayake in the Mirigama constituency and garnered 10,000 votes against 25,000 received by the first prime minister of Ceylon. It was certainly a pyrrhic victory for D.S. Senanayake and I think that young Samarakkody’s 10,000 votes scared the ‘old man’ out of his wits. All that I contributed to this mini-eulogy was what I had heard from my father in 1965, including the rounded numbers of 10,000 votes for Edmund and 25,000 votes for D.S.Senanayake in the 1947 election. At that time, I didn’t have the Sri Lankan Parliamentary Election results (source book) in my hand. The quoted numbers were good approximations of the recorded result. Nevertheless, I provide below the recorded results of Samarakkody’s performance in the island’s general elections between 1947 and 1965, in this extended eulogy. Before that, I’ll mention the context of what my father had told me. I still remember March 23, 1965 – the day after the general election. It was the first general election in which I learnt the island’s electoral history from my father. He was in a ‘half happy-half sad’ mood. He was elated for one result from the Tamil land; but saddened by the one result from the Sinhala land. My father came of age before political parties became established in the 1940s. So, he leveled up each politician (Sinhalese/Tamil/Muslim/Burgher) as an individual, irrespective of party affiliations. That particular day, my father was happy that G.G. Ponnambalam had regained the Jaffna seat, from Alfred Duraiappah, convincingly, with a majority of 2,550 votes – which was even better than Ponnambalam’s victory margin of 1,741 votes for the Jaffna seat in the 1956 election. My father felt that Duraiappah was a listless politician, to be the Jaffna MP, and he had merely scraped through the twin 1960 elections with meager majority votes of 889 and 298 votes, in three-cornered contests. While my father was happy with the Jaffna result, he was sad with the news of Edmund Samarakkody’s defeat as a sitting MP in the Bulathsinhala electorate, in which Edmund could poll only 278 votes. In my father’s ultimate assessment, “We had lost the sanest Sinhalese voice in the Ceylonese parliament and there won’t be anyone to fill Edmund’s shoes.” Then, my father told me – it was the same Edmund who as an underdog “shocked” D.S. Senanayake in 1947 in Mirigama, by polling 10,000 votes. Now I provide the context of what this meant to D.S.Senanayake in 1947. D.S. Senanayake (1884-1952) and S.W.R.D. Bandaranaike (1899-1959) were the first and fourth prime ministers of independent Ceylon. Though there was an age gap of 15 years between them, by the mid 1940s Bandaranaike had built up his political career to be the successor of D.S. Senanayake in the prime ministerial sweepstakes. But the wily Senanayake was secretly grooming his son Dudley, in preference to Bandaranaike. The political ascendancy of Senanayake, Sr. and Solomon Bandaranaike from the 1920s to the 1940s showed clean parallels. Senanayake, Sr. was first elected uncontested from Negombo district to the Legislative Council of colonial Ceylon in 1924. Then, in 1931 and 1936, he was elected uncontested to the Mirigama constituency to the State Council of colonial Ceylon. Solomon Bandaranaike also entered the State Council legislature in 1931, elected uncontested to the Veyangoda constituency, and again in 1936 was elected uncontested to the same constituency. And Samarakkody never lost that gravitas, until he died. Sure, in the Sinhalese political arena, Edmund Samarakkody lost gravitas in the 1965 election. But among Tamils, he never lost that gravitas as he was unique among the Sinhalese legislators for two reasons; (1) he talked and stood up for sense; and (2) he never compromised his principles for political office and Cabinet position. From the 1970s, we have had a quota of token Tamil Cabinet ministers – Kumarasuriyar, Devanayagam, Thondaman, Sr, Rajadurai, Kadirgamar, Devananda, and Thondaman, Jr being the lead names in the roster. Excluding Thondaman, Sr., none have gained gravitas among the Tamils, but Samarakkody didn’t lose his gravitas among the Tamils even when he was out of parliament. This was because Samarakkody was also a powerful writer. His commentaries of the 1970s to the journals of Leftist ideology were a powerful indictment on the racist policies of the Sirimavo Bandaranaike and J.R. Jayewardene periods. None of the Tamil Cabinet ministers (apart from Thondaman ,Sr. who published his autobiography) since the 1970s have had the guts and gravitas to write about the anti-Tamil policies of the Sirimavo and Jayewardene regimes. Thus, Samarakkody’s eight commentaries from the 1970s, contributed to the Workers Vanguard (New York), deserve due recognition, since these provide the political context (which has hardly been forthcoming from the contemporary Sinhalese and Tamil pulp historians) of why the first political assassination in Jaffna, that of Alfred Duraiappah in 1975, became inevitable. I provide the bibliographic details of these eight Samarakkody’s commentaries below, after providing his election performances between 1952 and 1965. In sum, Edmund Samarakkody contested six elections (1947 to 1965) from four different constituencies. He won three elections and lost three. Majority of winner 82 votes. Majority of winner 6,643 votes. Majority of winner 3,682 votes. Majority of winner 2,631 votes. Majority of winner 3,590 votes. 1. E.Samarakkody: Rightist takeover looms in Ceylon. Workers Vanguard, May 24, 1974, no.45, p.4. 2. An Interview with Edmund Samarakkody. Workers Vanguard, Oct.25, 1974, no.55, pp.3 and 10. 3. E.Samarakkody: JVP Trials Conclude – Harsh sentences for Ceylonese Youth Rebels. Workers Vanguard, Feb.14, 1975, no.62, pp.6 and 10. 4. E.Samarakkody: Bandaranaike Coalition dumps LSSP. Workers Vanguard, Oct.3, 1975, pp.6 and 11. 5. E.Samarakkody: Murderous repression against Student Movement in Sri Lanka. Workers Vanguard, Dec.3, 1976, no.136, pp.4-5. 6. 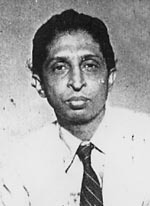 E.Samarakkody: Bandaranaike breaks Island-wide strikes in Sri Lanka. Workers Vanguard, Feb.4, 1977, no.143, pp.5 and 9. 7. E.Samarakkody: Behind Bandaranaike rout in Sri Lanka Elections. Workers Vanguard, Sept.2, 1977, no.171, pp.4-5 and 10. 8. E.Samarakkody: Behind the Anti-Tamil Terror – The National Question in Sri Lanka. Workers Vanguard, Oct.7, 1977, no.176, pp.6-7 and 10. Among these eight commentaries, only the first and the last have received entries in H.A.I. Goonetilleke’s multi-volume Bibliography of Ceylon. I did collect the originals of all these eight notable commentaries and plan to transcribe these for the electronic record during the course of this year.